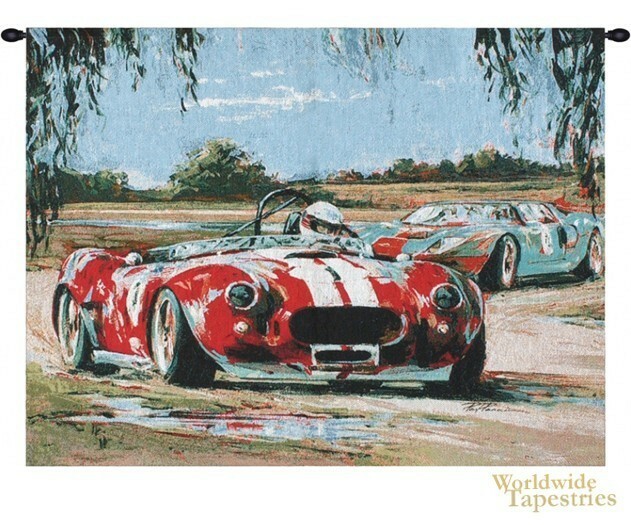 This tapestry "Racing In The USA" shows a car racing scene with superb color. We see a red and blue racing car, where the mottled colors are a reflection of the other car's body on itself. This is also echoed in the puddles of water on the track. A superb work for a car racing enthusiast. This car wall tapestry "Racing In The USA" is backed with a lining and has a tunnel for easy hanging. Note: tapestry rod and tassels, where pictured, are purchased separately. Note: tapestry rod and tassels, where pictured, are purchased separately. Dimensions: W 42" x H 35"